B. Ibaragi Prefecture. Retired Japan National Railways and Aikikai Shihan. First taught by Morihei UESHIBA in Iwama in the summer of 1946. Received the property on which his house was built directly from Ueshiba out of gratitude for helping to settle a land dispute. Considered the leading expert on the AIKI KEN and AIKI JO based on his long tutelage under Morihei Ueshiba in Iwama and subsequent refinement of weapons curriculum. 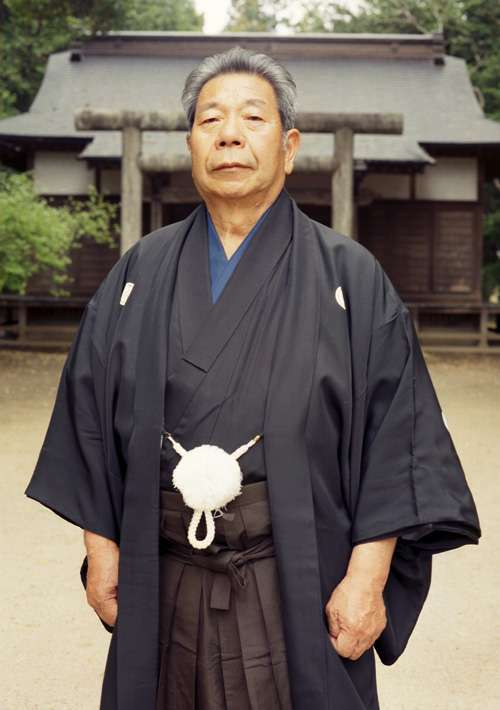 Author of six books on aikido, a Japanese-English five-volume series entitled Traditional Aikido and a short training manual entitled Takemusu Aiki. Former head of the Ibaragi Dojo in IWAMA and guardian of the AIKI SHRINE. Appeared in all four of the AIKI NEWS-sponsored FRIENDSHIP DEMONSTRATIONS. Taught on numerous occasions in the U.S., Europe, and Australia. Initiated a traditional style certification for the aiki ken and aiki jo beginning May 1989. Interviewed AN#32-34, 74-75. The above profile does not include that he made another set of books in the 1990's with Aikido Journal called "Takemusu Aikido". These books cover a tremendous number of variations of all sorts. The sixth volume is a remake of O'Sensei's "Budo" with comments by Saito Sensei. I refer to these volumes as well as the old set for the weapons when I teach in order to stay reasonably accurate. The other styles and weapons experiences I have learned, factor in to what I teach, so I'm not absolutely pure Iwama Style, but still pretty close. One of the things that I remember most about Saito Sensei was the size of his wrists when you went to grab him. He appeared to be normal size. Big by Japanese terms, but normal big guy size for Americans. I could not get my hands around his wrist. It was like trying to grab hold of a log. When I first met him he was still a conductor on the railroad. He worked for decades on the railroad, so perhaps that may not have been what he did his whole career. I would not have asked him about the railroad work because it would involved a conversation that I would just not know the words he would use. In speculating though, if he had started out as a kid 16 or 17 doing maintenance on the rail beds or the train cars, that would be really hard, heavy work. If he had worked swinging a sledge hammer from dawn to dusk or using huge, heavy wrenches on train car suspensions, his arms and body would have grown immensely strong doing that kind of work. Undoubtedly many of these videos were produced by Aiki News/Aikido Journal. I am not putting them on youtube. These have been loaded by others. I am just collecting the youtube url addresses and giving you a kind of loose directory. Many of these links were working up until about a year ago. I see some of them are not working now.